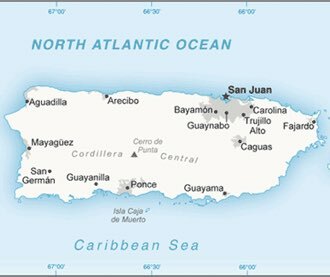 Puerto Rico : When and where to go? The climate is tropical, but the marine influences soften temperatures that remain between 25 ° C and 30 ° C throughout the year. There is a dry season between January and April, and a rainy season from May to December, with hurricanes occurring between August and October, often causing significant damage. The best time to visit the country is between January and March. You will probably start by San Juan, the capital: very active commercially, it also has a historic center, five centuries old, whose colonial architecture makes all the charm. The contrast is great with the skyscrapers that line the sea, and the white beach where to bask before enjoying all the attractions of this dynamic city. The northeast coast: lined with coconut trees, the playa Luquillo welcomes you with its clear waters and white sand. Higher up, you will discover the rain forest of El Yunque, where you can hike up to the peak located at a little more than 1000 meters, or on one of the 13 paths of the reserve, marveling at hundreds of species of Trees and orchids, but also frogs and parrots. The city of Ponce, second in the country, is worth a detour for its atmosphere, which you will enjoy on the central square with its colorful constructions of colonial architecture, its cathedral, its lion fountain and its many museums. Do not miss the reconstituted village dedicated to Taino culture, and the contiguous museum. On the south coast, wild and warm, you will find superb beaches, where locals meet on weekends, but are far less touristy than those in the north. To see also, the reserve of Guanica, and the small town of San German, charming and very colorful. Nearby, the Phosphorescent Bay, where admire an exceptional phenomenon of bioluminescence: magic! For surfing enthusiasts, it is on the west coast that you must go to Rincon especially, especially in winter when the rollers roll on the beach. In summer, the divers will enjoy themselves, with a simple mask and a snorkel. Astronomy enthusiasts will visit the Arecibo Observatory. In the center, the mountains of the Central Cordillera will offer the traveler their steep relief, but also the coffee plantations and a piece of tropical forest, exotic fruit orchards, small perched villages, lost farms, which can be Discover an equestrian walk, or hike in the canyon of San Cristobal. A valid passport and ESTA electronic travel authorization are required to enter Puerto Rico (as for the USA). The current currency is the US dollar. There are direct flights from London, Madrid or Frankfurt, and you will land at Luis Munoz Marin Airport, near San Juan. To travel on the spot, the most convenient is undoubtedly to rent a car. Public transport is present but unreliable in terms of timetables. You can also use taxis in town, and boats serve the islands. Domestic flights also provide several destinations. Budget: For an average budget, about 15 € per meal, and 100 euros for a hotel room in a small family establishment. The cheapest accommodation is undeniably camping, and to eat "economical" the kiosks offer dishes at 5 €. Health: As always, it is advisable to have up to date its classic vaccinations. An imperative: protecting oneself against mosquitoes (there was a dengue epidemic in 2009 and some cases of chikungunya). Attention also to the jellyfish, which are quite numerous, and to manchenilliers, shrines secreting a toxin that burns the skin. Safety: Avoid camping in isolated areas, due to possible thefts and attacks.